As the MOTUL FIM Superbike World Championship heads into the third round of the season, fans will not only have access to some of the best racing out on track, but they will also be involved with some of the best off track action to start the European leg of the season. With children and seniors going free, and all tickets included free entry into the paddock and pit walks, the Pirelli Aragon Round will already be off to an exciting start. Ever expanding and developing, the Paddock Show is getting a European makeover this season, and will be even more involved in the action throughout the weekend. Beginning on Friday with the usual Sofa Racer chats, fans quizzes and the Opening Day show, it will be the first chance fans get to meet their heroes. But the Paddock Show stage really comes alive on Saturday with the all new Podium Show. After Race one on Saturday afternoon, riders will come into the all new Parc Ferme below the stage to celebrate with their team before heading to the podium on stage. Fans will then have the opportunity to see riders minutes after the Prosecco Doc is sprayed as they head out for the Race 1 Podium Show. Returning back to stage in the afternoon for the SuperShow and a meet & greet, the action never stops. On Sunday there will be Race Podium Show’s for all classes, as the new format will have fans more involved than ever before in celebrations. Fans have the option to get a taste of what it feels like to ride around the undulating MotorLand Aragon circuit, as circuit laps are on offer on Sunday at 16.00h. As simple as riding your bike to the track and booking a place at the box office over the weekend, it’s not one to be missed. Entrance is free providing you get a ticket, and you could feel like WorldSBK rider for the day. Your ticket doesn’t just gain you access to the WorldSBK racing on track, but this year it also means you can gain entrance onto the Pit Walk for free. 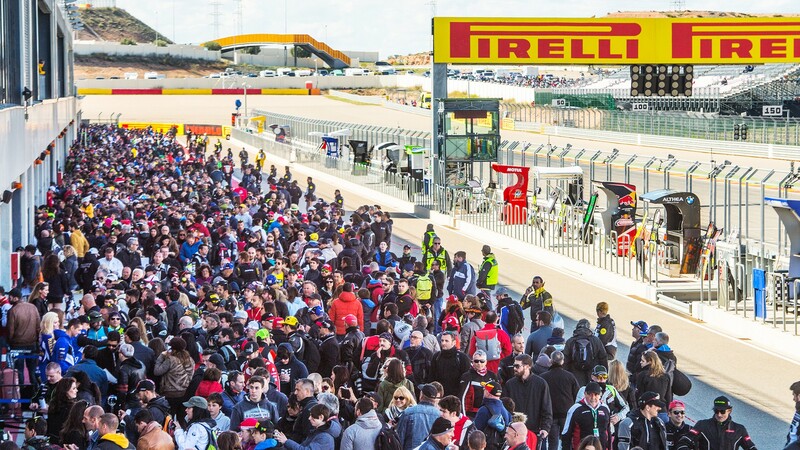 With two opportunities to head out into pit lane and get a glimpse inside the garages and maybe even an autograph or two, the Pirelli Aragon Round is the gift that keeps on giving. Want to head over to the Fan Zone and show your support for WorldSBK? From Friday to Sunday the ever popular Zone will be open with a bikes exhibition, merchandising and shops, an expo area and even an animation area for your children. Get yourself an SBK® t-shirt to wear for the pit walk, or take a look at your dream bike in the expo area. If the racing action on the track hasn’t quashed your racing bug, you can head to the Go-Karting track from Thursday – Sunday, as it’s open from 9 – 13h or 14 – 18h. With plenty of opportunities to take to the track with your friends and family, it could really top off a sensational weekend. Don’t miss out on any of the action off track at the Pirelli Aragon Round, and feel the pure entertainment and excitement of WorldSBK.